It brings brighter days and sprouting beauty. In our family it's brought Sweet Sebastian !!!! 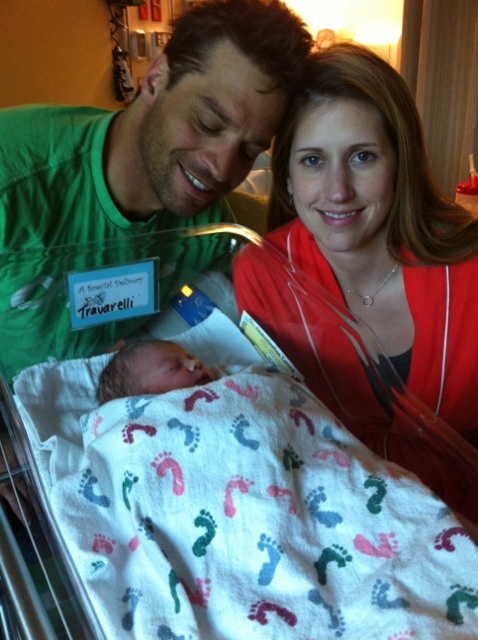 My brother Carlo and his beautiful wife Jen gave birth to their beautiful boy Sebastian Don on March 19 . This is quite significant for our family as Seb as he will be called ( we are very big on nicknames in this family ! I've already came up with Sebalicious, Seabaru, and Seababdebadoo, you get the point!) was born on our late fathers birthday. 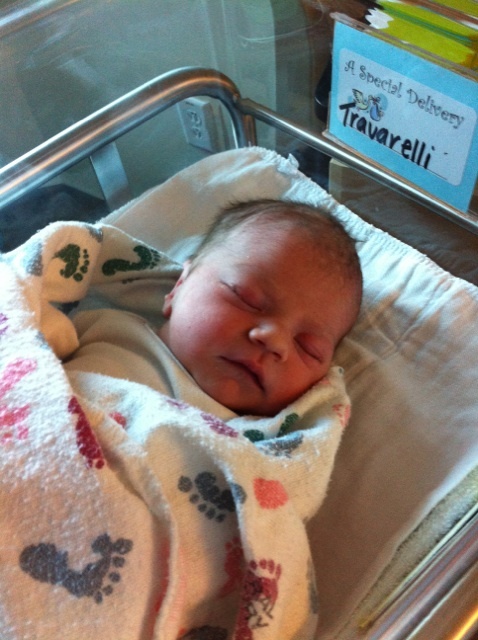 Seb will now carry on our family name as my brother was the last male in our family to hold the name Travarelli ! We Italians are very big on our names and heritage !! Now I can't let my baby brother go without some ribbing from his big sister , If you remember I think I mentioned that he is the youngest of four and the only boy, so he is the know as the GOLDEN CHILD ! What does he go and do, he had to have a baby boy on our dads birthday !!!! What does that make him know PLATNIUM!!! Show off ;-) !!! Let me explain a bit if you have the time about how Golden he is to our elder relatives...my father's Aunt Jenny never had children, so we were like her grand kids. My mother and my sisters and I spent a lot of time being with her and caring for her in her later years. My brother went off to Utah to become a professional skier and wasn't around as she got older. She died a few years ago at 90ish . In a letter she left for us about details for her funeral she stated that "before my casket is closed please have Carlo place my green wool coat over me and shut the casket " REALLY ..not that I would of wanted the job!!! When my grandfather died this same aunt gave me a box of his belongings ( he suffered from Alzheimer's and again me and mother cared for him in our home and while skier boy was jumping off mountains..really I am not bitter at all ;-) and said "here these are for your brother, hold them for him"
Oh well what is an Italian girl to do! This is all said in good fun ...they make great family stories!! Back to sweet Seb I am moving along on his blanket . I have to admit I kinda wanted "Seb" to be a "Red" (for red riding hood, that's what I was gong to call the baby if it was a girl) . Girls are so much fun to crochet for and being that my last kiddo was a boy I was hoping ! Seb's crocheted blanket is inspired by the whole"Mori" girl style ..I know I know... I need to let the girl thing go, but that it's style is inspired by the woodlands and forest. We are a very outdoorsy family. The colors remind me of the forest and I just love the mossy green ..I did a granny square as its base and will add an edging. I am going to back it with fabric . I will put the pattern up as well. It is a quick and easy pattern. It will make a nice stroller blanket. I am also working in my pot holders for the 2013 pot holder swap on Flickr . They are very spring inspired as I gave them a clover shape . Again so quick and easy and fun...I am thinking of making a garland with the leftovers. Spring is here, though it doesn't feel like it here in Nj. We are supposed to get snow tomorrow!! I hope it does come soon ..until then I will bask in the light of Sweet Sweet Sebastian. I can not wait to cover his face with kisses!! This was supposed to be posted on Thursday, but our computer has been down all weekend...so i hope you weekend was full of light love and beauty! I spent 3 hours the other working to create a new pattern, a complete bust and frustrating. That I wasted all that time and that nothing came of it drove me "cra cra" (crazy) as my girls would say! Thinking I knew exactly where I was going to end up in the creation. ...Or was time wasted and did something come of it...? Hmm. Then I took a look at some of my finished projects and I realized something ...how symmetrical they all are . They are all very balanced, you would think I had a background in Engineering like my hubby! I realized that may be part of my problem. ...then I started thinking on a yogic point of view. Let's dissect...I am a Sagittarius, creative, passionate and adventurous etc, and I am these to a degree... as long as both feet are planted firmly on the ground. REALLLLY planted !!!! Like concrete shoes at times! Now look at the 5 elements of nature, Earth, Air, Fire,Water,and Ether/Space. These elements of nature sometimes become unbalanced in us. I see where I become unbalanced within these elements . The symmetry of my designs coincides with the earth element (ground) and fire (control), being too balanced and both feet firmly on the ground afraid to let go, needing to be in complete control. This is where my earth and fire element are obstructed. I am too grounded and need to know exactly at times where I am going . . Afraid to let go and fly and get in touch with my air element (to be continuous) or just sit in spaciousness(ether/space) not knowing when or where or how or if I will land . These elements tend to be out of reach for me at times. I see where this holds me back. What has caused the obstructed earth/fire element. I believe the sudden death of my father in my teens, becoming a mother at 19, divorce at 27, a new family etc .. It has just made me play it all too safe and rightfully so. However it creeps into other aspects of life without you knowing it ..I see its shadow places now ( after many years of studying yoga psychology and counseling). For it to show up in my crafting and creating WOW! How did I realize this ..well in the shower .. Yup here comes the water element (clarity). When balanced, the water element refreshes, washing away residues that accumulate over a lifetime and brings clarity. SO we can see deeply. I always have my AH HA moments in the shower being in touch with my water element. This is where I realized I am being too safe and structured . I must learn to fly more with my designs, make more mistakes, you know get a little jiggy with it (channeling my inner Will Smith)! Maybe work and design and not know where it is going to go and being without fear in that. Don't get me wrong.. I LOVE my designs and how they come out and I am glad that I tend to be a grounded being. I am so thankful for all the experiences in my life even the difficult ones. I am glad I can figure put where my obstructions are and can now work from this point of view. Share with me ...what obstructs you ? Here is a project that I am flying by the seat of my pants with ..now I know what your thinking ..it looks like just a granny square!! It will end up being a blanket for my brothers new baby and it will be more than just a granny square ..and I will just sit back and work and just see where it lands! The little legs will belong to a crocheted dragon form Lalylala pattern on Etsy. After being cooped up all last week with the stomach bug I escaped to a local quilt shop and came home with these. I love how sweet and soft these are ! YUP, I have no idea what I am going to do with these either !!! 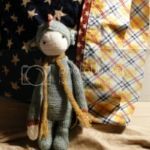 As I look at these pictures as I write this post I see all the balance in the fabrics ...gonna have to shake it up a bit! Here it is finished Yay!! its been a rough week we have been side tracked with the stomach bug . It is starting with the little guy and now it is just a wait and see who gets it next! I think this winter loving girl needs Spring to get here!! robin in the tree..Spring !! and the final tea towel! Now my inspiration for this was from my last yoga retreat ... we talked a lot of beauty and blissful states of mind. It got me to thinking of how we are so attracted to beauty and in this state of beauty we feel its blissfulness and of course this leads to the growing of love . Whether it is an object, person or state of mind, this is how I interpret love to begin. Like a freshly bloomed flower our eye catches it gross form (not disgusting gross but gross as in tactile) then we smell its scent, its subtle form ,we become intoxicated, feel the bliss and then grows our fondness and love as we make the connections to all these states of mind and senses. Same as our relationships in life don't you agree? Here is the Cream of Broccoli recipe from last week.. In a heavy pot add olive oil ,saute onion and brocolli till tender about 10 minutes on low to medium stirring frequently. Now add the half and half , this is optional and can be left out to make it vegan. Also you can adjust half and half accordingly to your taste. Garnish with a sprinkling of cheddar cheese and enjoy! Easy isn't it! a side note ...i think adding some potato to the saute would be a good idea to add substance if you are not adding and dairy. What I've been up to this week.. He was very proud of his driving abilities ... we had it powered down..responsible parents I swear! This is what it took the next day to get moving...It was a lot of yard work! This is what the weather has been like lately.. Original recipe, cream of broccoli soup ..a lower fat version. Could easily be vegetarian and vegan too! I loved it but needs some tweaking. How was your week ? hope it was a good on, would love to see what you have been doing!